No Risk Buying with Techo since you have 100% customer warantty with us! MULTIPLE FUNCTION: Verstatile tool for frothing or steaming milk for lattes, measure liquids, serve milk or cream. PREMIUM QUALITY: Made of chrome finished stainless steel,the frothing pitcher is rust-proof, stain-proof, crash-proof and heat-proof, unbreakable by daily use. Dishwasher-safe. CONVENIENT DESIGN: The inside measurement lines design that easy to control liquids and dripless spout means no mess and perfect latte art. CAPACITY: 600ml/20 fl.oz. big enough volume to use at home or office for you and a couple of friends. 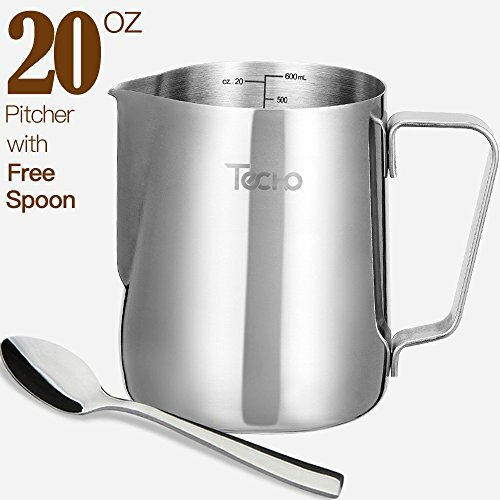 100% Customer Satisfaction: Any question with Techo Milk Frothing Pitcher, please contact us! You can enjoy Lifetime Guarantee with 100% Satisfaction anytime! View More In Milk Frothing Pitchers. If you have any questions about this product by Techo, contact us by completing and submitting the form below. If you are looking for a specif part number, please include it with your message.